100 Year Old Weblog: ATTEMPTS MURDER TO CONCEAL RECORD OF POLICE PROBE ~ THUG STRIKES DOWN MISS A. LEE OWN IN HER OFFICE IN THE DWIGHT BUILDING. ATTEMPTS MURDER TO CONCEAL RECORD OF POLICE PROBE ~ THUG STRIKES DOWN MISS A. LEE OWN IN HER OFFICE IN THE DWIGHT BUILDING. ley May Offer Reward Today. UNKNOWN THUG STRIKES DOWN POLICE BOARD'S GIRL STENOGRAPHER; STEALS RECORD OF INVESTIGATION. Struck on the left temple with a "black jack" by an unknown thug, Miss Anna Lee Owen, a public stenographer who has been taking the evidence in the investigation held by the police commissioners, was knocked unconscious while at work in her office, 605 Dwight building, last night and a part of her stenographic notes stolen. She was taken to the University hospital immediately after being found by Hugh E. Martin. She is said to be in critical condition. Her skull probably is fractured. Mayor Crittenden personally offers a reward of $100 for the arrest of her assailant. The attack upon Miss Owen was made some time between 6:30 and 7:15 o'clock, while she was alone in her office. She regained consciousness before being removed to the hospital, but was not able to furnish a description of her assailant. Miss Owen's office is separated from the hall by a reception room. When Mr. Martin left the office at 6:30, she was at work on the notes. The hall door was closed and also the door leading from the reception room into her office. Mr. Martin returned to his office at 7:15. Opening the door into Miss Owen's office, he found her huddled on the floor. Believing she had fainted from overwork, he lifted her head and was startled by her groaning as if injured. Liquor which was kept in another office in the suite was secured by Martin and he rubbed the young woman's head with it. She partially revived and exclaimed, "Mother, they have taken my notes." Dr. Eugene Carbaugh was summoned to attend Miss Owen, and Commissioner Thomas R. Marks was notified. He informed the police and then took personal charge of the case. 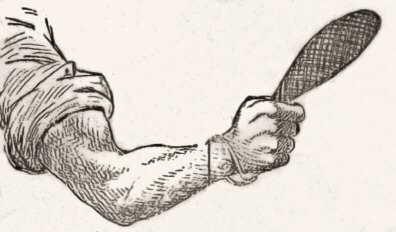 A BLACK JACK, SUCH AS WAS PROBABLY USED IN THE COWARDLY ASSAULT ON MISS OWEN. Inspector of Detectives Edward P. Boyle carried Miss Owen down stairs in the elevator and placing her in an automobile assisted Dr. Carbaugh in supporting her during the drive to the hospital. From what little Miss Owen could tell last night she was working over her typewriter when she heard a step behind her chair. Knowing that the men who had offices in the suite had gone home, she looked up to see who it was. She had not heard the outer doors opened. Just as she secured a glance of the figure of a man, she was struck down. The stenographic notes and transcripts which she had made during the trials and investigations before the police commissioners were always carefully guarded by Miss Owen, who was afraid an attempt would be made to steal them. The notes were securely locked up in the office vault each night. When an investigation was made after she regained consciousness it was found that a large part of her notes were missing. Just what notes were secured is not known. It was said that the evidence given late yesterday afternoon in the trial of the case against the conduct of the saloon conducted by James Redmond, 1205 Walnut street, were not secured. But it is believed that a large part of the testimony in the other investigations was lost. 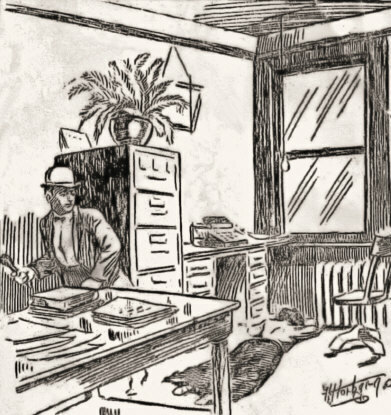 Through the inability of Miss Owen to assist the police by furnishing a description of her assailant, and also the failure of the police to elicit any information from the elevator operators was impossible to secure a clue to work on. No one could be found last night who had seen or noticed any stranger loitering in the halls or around the office in the Dwight building. When Commissioner Marks arrived he ordered that the police make every possible effort to capture the thug, and until midnight he was actively engaged in directing the police in their work. The police were not notified of the assault until 8 o'clock, and inspector Boyle dispatched e very officer in the headquarters at the time to the scene. He and Captain Whitsett followed and were closeted with the commissioner for some time. Every detective in the city was called in and placed at work upon the case. The the substations were notified, and in all over 150 police officers were engaged in searching the city. After the assault last night Commissioner Marks informed the police that he had been followed and shadowed by two men since he began his activity in the police shakeup. Not only has Mr. Marks been trailed, but Miss Owen has been dogged by two men to and from her work in the city. She was not positive of this surveillance, according to Mr. Marks, until Tuesday evening after the adjournment of the police board. Intuitively feeling that she was being followed, Miss Owen boarded a Twelfth street car and transferred to a Northeast car. Arriving at Budd park she left the car and entered the park. All of this time the suspected man was in close proximity. At the park he disappeared for a time but was on hand when she again got on a car to ride into the city. She went to the Dwight building after leaving the car and while on the sixth floor saw the man in the hall. She then went to the office of Mr. Marks and informed him of what she had done. Telling her to hold a handkerchief to her mouth if she saw the man on the street, Mr. Marks went down and walked around. He found a man on the street who appeared to fit the description of the man who had bothered Miss Owen, but she denied he was the one. The police were not notified at any time previous to the assault that either Miss Owen or the commissioner were being shadowed. On another occasion it is said Miss Owen was frightened by men who followed her about the streets and went to the Coates house for the night, instead of returning to her home. While there, it was said, she received a telephone message from some man who refused to give his name. The purport of the telephone message was that there was a man in an adjoining room who intended her harm. The mother of Miss Owen, who visited her daughter at the University hospital last night in answer to questions, said that her daughter had never mentioned to anyone at home that she was annoyed by anyone or that she had ever been followed. On orders received from Mr. Marks, the hospital authorities refused to allow anyone to see Miss Owen. Strict orders were issued to not allow anyone but the nurse, her physicians and mother to visit the young woman. A special nurse was secured for her and the police commissioner's orders included a special diet for Miss Owen. Several hours after the assault Dr. A. H. Cordler was called in consultation and the patient was pronounced to be in a very critical condition. The Dwight building was thoroughly searched by the police. Every street car in the city, and especially those leading into the suburbs, was being ridden by a police officer all night long. The outgoing trains were watched, although the police believed that the man would endeavor to leave the city by street car. Inspector Boyle said last night that it was his opinion that the attack upon Miss Owen, and the theft of the stenographic notes, was done by an imported thug. If it was accomplished by home talent the inspector expressed the opinion that it was done on the spur of the moment to cover, if possible, damaging testimony given during the recent investigation. If the thug was imported for the purpose, St. Louis is probably the city, Inspector Boyle said, and his belief is also that of Captain Whitsett and Chief of Police Frank Snow. Two men who have already figured in the police investigation and the saloon trials were ordered arrested and locked up of investigation. The theory of the police is that while these two men did not do the work they could give valuable information as to who did. But the men had not been found at 1 o'clock this morning. Captain Whitsett said he believed that the man would be arrested before twenty-four hours had passed. Acting Chief Snow said the man would be in custody by morning and inspector Boyle was positive he could not escape arrest.